The example is made in light worsted weight mercanized cotton. Size: This blanket can be made any size. Five widths are given in the directions. dc2tog – double crochet 2 stitches together (uses two stitches, decreases by one stitch) – [Yarn over, insert hook in next stitch, yarn over and pull up loop, yarn over, draw through 2 loops] 2 times (3 loops on hook), yarn over, draw through all loops on hook. dc5tog – double crochet 5 stitches together (uses five stitches, decreases by four stitches) – [Yarn over, insert hook in next stitch, yarn over and pull up loop, yarn over, draw through 2 loops] 5 times (6 loops on hook), yarn over, draw through all loops on hook. The beginning chain should be a multiple of 52 plus 2. After the first row, make all stitches in both loops. There is also a chart available for this pattern. Row 1: Sc in 2nd chain from hook, sc in the next ch, [skip 3 ch, (dc, ch2, 2dc, ch2, dc) in next ch, skip 3 ch, sc in next chain] twice, sc in each of the next 18 ch, [skip 3 ch, (dc, ch2, 2dc, ch2, dc) in next ch, skip 3 ch, sc in next chain] twice, ** sc in next two ch, [skip 3 ch, (dc, ch2, 2dc, ch2, dc) in next ch, skip 3 ch, sc in next chain] twice, sc in next 18 ch, [skip 3 ch, (dc, ch2, 2dc, ch2, dc) in next ch, skip 3 ch, sc in next chain] twice. Repeat from ** across to last ch, sc in last ch. Turn. Row 2: Ch3, 2dc in first sc, sc in next sc, (4dc in ch sp, 4dc in next ch sp, sc in next sc) twice, dc in next 4 sc, 2 dc2tog (using next 4 sc), dc in next sc, 2 dc2tog (using next 4 sc), dc in next 4 sc, sc in next sc, (4dc in ch sp, 4dc in next ch sp, sc in next sc) twice, ** 5dc in next sc, sc in next sc, (4dc in ch sp, 4dc in next ch sp, sc in next sc) twice, dc in next 4 sc, 2 dc2tog (using next 4 sc), dc in next sc, 2 dc2tog (using next 4 sc), dc in next 4 sc, sc in next sc, (4dc in ch sp, 4dc in next ch sp, sc in next sc) twice. Repeat from ** across to last sc, 3 dc in last sc. Turn. Row 3: Ch3, 2dc in second dc, 2dc in next dc, ch4, skip (sc, 3dc), sc in next two dc, ch7, skip (3dc, sc, 3dc), sc in next two dc, ch4, skip (3dc, sc), dc in next 2 dc, 2 dc2tog (using next 4 dc), dc in next dc, 2 dc2tog (using next 4 dc), dc in next 2 dc, ch4, skip (sc, 3dc), sc in next two dc, ch7, skip (3dc, sc, 3dc), sc in next two dc, ch4, skip (3dc, sc), ** (2dc in next dc) twice, dc in next dc, (2dc in next dc) twice, ch4, skip (sc, 3dc), sc in next two dc, ch7, skip (3dc, sc, 3dc), sc in next two dc, ch4, skip (3dc, sc), dc in next 2 dc, 2 dc2tog (using next 4 dc), dc in next dc, 2 dc2tog (using next 4 dc), dc in next 2 dc, ch4, skip (sc, 3dc), sc in next two dc, ch7, skip (3dc, sc, 3dc), sc in next two dc, ch4, skip (3dc, sc). Repeat from ** across to last 2 dc and turning chain, (2dc in next dc) twice, dc in top turning ch. Turn. Row 4: Ch1, sc in first dc and in each of the next 4 dc, sc in ch4 sp, (dc, ch2, dc) in each of the next two sc, sc in ch7 sp, (dc, ch2, dc) in each of the next two sc, sc in ch4 sp, sc in each of (the next two dc, next two dc2tog, next dc, next two dc2tog, next two dc), sc in ch4 sp, (dc, ch2, dc) in each of the next two sc, sc in ch7 sp, (dc, ch2, dc) in each of the next two sc, sc in ch4 sp, ** sc in each of the next 9 dc, sc in ch4 sp, (dc, ch2, dc) in each of the next two sc, sc in ch7 sp, (dc, ch2, dc) in each of the next two sc, sc in ch4 sp, sc in each of (the next two dc, next two dc2tog, next dc, next two dc2tog, next two dc), sc in ch4 sp, (dc, ch2, dc) in each of the next two sc, sc in ch7 sp, (dc, ch2, dc) in each of the next two sc, sc in ch4 sp. Repeat from ** across to last 4 dc and turning ch, sc in last 4 dc, sc in top of turning ch. Turn. Row 5: Ch3, 2dc in second sc, 2dc in next sc, dc in each of next 2 sc, sc in next sc, (4dc in ch sp, 4dc in next ch sp, sc in next sc) twice, 2 dc2tog (using next 4 sc), dc in next sc, 2 dc2tog (using next 4 sc), sc in next sc, (4dc in ch sp, 4dc in next ch sp, sc in next sc) twice, ** dc in next 2 sc, (2dc in next sc) twice, dc in next sc, (2dc in next sc) twice, dc in next 2 sc, sc in next sc, (4dc in ch sp, 4dc in next ch sp, sc in next sc) twice, 2 dc2tog (using next 4 sc), dc in next sc, 2 dc2tog (using next 4 sc), sc in next sc, (4dc in ch sp, 4dc in next ch sp, sc in next sc) twice. Repeat from ** across to last 5 sc, dc in next 2 sc, (2dc in next sc) twice, dc in next sc. Turn. Row 6: Ch3, 2dc in second dc, 2dc in next dc, dc in each of next 4 dc, ch4, skip (sc, 3dc), sc in next two dc, ch7, skip (3dc, sc, 3dc), sc in next two dc, ch4, skip (3dc, sc), dc5tog (using next 5 dc), ch4, skip (sc, 3dc), sc in next two dc, ch7, skip (3dc, sc, 3dc), sc in next two dc, ch4, skip (3dc, sc), ** dc in each of next 4 dc, (2dc in next dc) twice, dc in next dc, (2dc in next dc) twice, dc in each of next 4 dc, ch4, skip (sc, 3dc), sc in next two dc, ch7, skip (3dc, sc, 3dc), sc in next two dc, ch4, skip (3dc, sc), dc5tog (using next 5 dc), ch4, skip (sc, 3dc), sc in next two dc, ch7, skip (3dc, sc, 3dc), sc in next two dc, ch4, skip (3dc, sc). Repeat from ** across to last 6 dc and turning chain, dc in each of next 4 dc, (2dc in next dc) twice, dc in top turning ch. Turn. Row 7: Ch1, sc in first dc, sc in next dc, skip 3 dc, (dc, ch2, 2dc, ch2, dc) in next dc, skip 3 dc, sc in ch4 sp, (dc, ch2, dc) in each of the next two sc, 3sc in ch7 sp, sc in each of the next two sc, 4sc in ch4 sp, sc in dc5tog, 4sc in ch4 sp, sc in each of the next two sc, 3sc in ch7 sp, (dc, ch2, dc) in each of the next two sc, sc in ch4 sp, ** skip 3 dc, (dc, ch2, 2dc, ch2, dc) in next dc, skip 3 dc, sc in each of the next 3 dc, skip 3 dc, (dc, ch2, 2dc, ch2, dc) in next dc, skip 3 dc, sc in ch4 sp, (dc, ch2, dc) in each of the next two sc, 3sc in ch7 sp, sc in each of the next two sc, 4sc in ch4 sp, sc in dc5tog, 4sc in ch4 sp, sc in each of the next two sc, 3sc in ch7 sp, (dc, ch2, dc) in each of the next two sc, sc in ch4 sp. Repeat from ** across to last 8 dc and turning ch, skip 3 dc, (dc, ch2, 2dc, ch2, dc) in next dc, skip 3 dc, sc in next dc, sc in top of turning ch. Turn. Repeat rows 2 through 7 until afghan is desired length. End with a row 6 then complete these last two rows. Next to last row: Ch1, sc in first dc and in each of the next 8 dc, sc in ch4 sp, (dc, ch2, dc) in each of the next two sc, sc in ch7 sp, (dc, ch2, dc) in each of the next two sc, sc in ch4 sp, sc in dc5tog, sc in ch4 sp, (dc, ch2, dc) in each of the next two sc, sc in ch7 sp, (dc, ch2, dc) in each of the next two sc, sc in ch4 sp, ** sc in each of the next 17 dc, sc in ch4 sp, (dc, ch2, dc) in each of the next two sc, sc in ch7 sp, (dc, ch2, dc) in each of the next two sc, sc in ch4 sp, sc in dc5tog, sc in ch4 sp, (dc, ch2, dc) in each of the next two sc, sc in ch7 sp, (dc, ch2, dc) in each of the next two sc, sc in ch4 sp. Repeat from ** across to last 8 dc and turning ch, sc in last 8 dc, sc in top of turning ch. Turn. Last row: Ch1, sc in first sc, sc in each of next 9 sc, (4dc in ch sp, 4dc in next ch sp, sc in next sc) twice, sc in next 2 sc, (4dc in ch sp, 4dc in next ch sp, sc in next sc) twice, ** sc in next 18 sc, (4dc in ch sp, 4dc in next ch sp, sc in next sc) twice, sc in next 2 sc, (4dc in ch sp, 4dc in next ch sp, sc in next sc) twice. Repeat from ** across to last 9 sc, sc in last 9 sc. Finish off and weave in end. The blanket can be made in a solid color or can be made with any number of color changes. The best way to make a color change is to finish all but the very last pull through of the two loops of the last stitch of a row. Cut yarn with a few inches of tail and join with new color next to stitch. Pull new color through last two loops. Weave in ends. Oh my gosh this is just gorgeous..I love it in the color youi selected! This is gorgeous! I can’t wait to try it. I just love your patterns. I need to finish up my doily project so I can jump into an Afghan project!! Thanks! This Afghan is just beautiful. We have 7 ladies that meet every Tuesday and one had this pattern. We will all be making one, working on it each Tuesday. Thanks for your beautiful pattern. asy…, is there a diagram with this ? FleurBelge, 63 years old ,loving crochet from Belgium. I have the same problem. Can’t read the pattern but show and tell still work at our age. Please let me know too. FleurBelge, there is a chart in the instructions. It is in the beginning, the word “Chart.” It is highlighted, click on it and it will take you to the diagram instructions. I hope this helps you! This is just beautiful. I would love doing this up into a shawl. 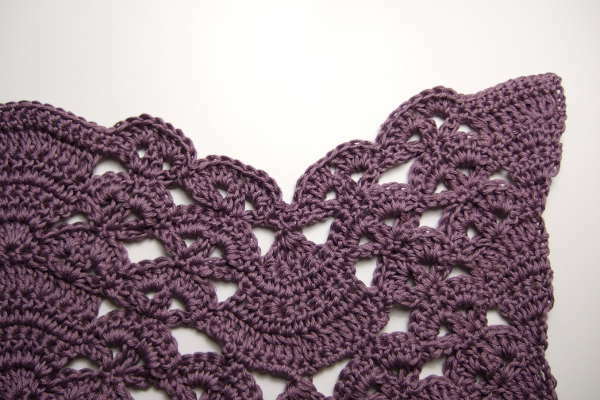 I’m going to crochet the Xsm size to get use to the pattern then change it to a shawl size. I just love the pattern. Thank you so much. GREAT idea!!!!! It’s such a gorgeous pattern it would be a beautiful shawl! Please keep in touch with me when you do this. I might jump in with you and do one, too! I was thinking as well that it would be a gorgeous shawl. 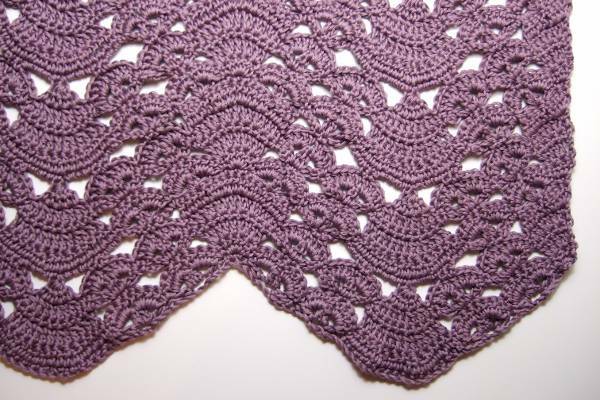 If you have success how about sharing the changes you made to make the pattern a shawl? I’m interested in making this gorgeous pattern into a scarf. Has anyone adapted the pattern for this yet? Gosh! Your patterns are so lovely! I want to try so many. It’s like stepping back 100 years. I’m gonna be a busy girl….. This pattern is absolutely gorgeous. Can’t wait to try it! This is absolutely gorgeous. I really want to make it in a yarn weight lighter than worsted. Has anyone ever tried this? Beautiful pattern – can’t wait to crochet this one. Thanks! I have been searching for a pattern to use to make a bedspread for my queen-sized bed. This pattern is IT!!! I am finishing up one that has taken me 3 years to complete (made in granny squares which has been a super big mistake as I loathe stiching the squares together). The bedroom lamp I have makes it hard to find anything that I like that would repeat a suptle vine/flower combo and this blanket will work perfectly. THANK YOU for designing such a lovely pattern. In about a year or so I’ll post a picture of the completed project. Would be nice if you put your comments at the beginning of the patterns ( which I really love!!) because when I go to copy them for my senior friends , it uses a lot of ink. . This way I could get them copied without using all that expensive ink up! There is a print button at the top of each of the patterns that will put the pattern on a page without the comments. It also formats them cleanly for printing. I copy and paste into my Word program. I copy the picture and paste and then copy the directions and paste. This is just beatuiful. Will be awhile before I can start one as I am tring to get ready for a craft show. OMG, this thing is divine!!!!! Yes, it looks like it could be a very vintage design, but it also has a look of some middle eastern influence. I can’t imagine being able to come up with something like this pattern in my own head, or how many hours it must have taken. I’ve recently finished a very intricate pattern (crocheting, NOT designing! )in a solid color and don’t think I could handle another one any time soon, but I just had to tell you how much I love your work! Wow, I love this pattern. I am a new crocheter! 4 baby blankets and a pair of fingerless arm warmers in a very Victorian pattern. Would you call this pattern an advanced crochet pattern? It appears to be. I love when the pattern states, easy, intermediate etc. Helps us newbies to progress and not pick something too hard and end up on completing a piece. Thanks ever so much for sharing your talent. http://www.AllFreeCrochetAfghanPatterns.com has a link to it and they are calling it Intermediate. I think that is probably pretty accurate. A while back I talked to my web guy (husband) about adding the difficulting rating to the patterns. It is definitely on his to-do list. I shared your comment with him. Thanks for letting me know that would be a helpful upgrade. I just retired and have not crocheted for awhile and was looking for something that would peak my interest. This really does it for me. I cannot wait to get to the store and buy the yarn and make it. I have printed several other of your patterns to do. I wish I was as creative as you are and thank you so very very much for sharing your talent with us. Like everyone else, I think this is absolutely gorgeous! But you will probably be surprised why I am especially pleased by it. I love patterns which change often and require counting. Not only does it keep me from getting bored with the project, but my arthritic fingers don’t hurt as often as well. Bravo on a wonderfully designed afghan. I agree with another poster that it would make a wonderful shawl. (funny I can design other things…but don’t do well designing crochet patterns.) I wonder if it is because I have to keep stopping to write down precisely what I did? I am with you. I prefer patterns that change often and require counting. I too get bored and get lost, unless I really have to concentrate. This pattern is going in my que of patterns that I want to make. (There are so many now!) This is gorgeous. I may have to keep this one for myself! My jaw dropped when i saw this… So lovely! Really love this pattern! Have about ten projects to finish before I can start a new one, but this one is next on my list. Thanks for sharing. Love it. Will make it after I finish about ten projects in process. Thanks for sharing. I have stumbled upon your beautiful Patterns, and they are all very easy to read and work up wonderfully. I have been crocheting for a few years, and I haven’t wanted to try something different that granny squares, but with this one, I am going to venture out and try to improve my crocheting skills. Thank you so much for designing such wonderful projects. You now have a new faithful follower. What a gorgeous pattern. Hope to try it soon. Thank you so very much for sharing your talent with those of us who can only copy, not create. …and thank you for allowing changes to text size when printing. So beautiful. I want to try it. Thank you. but I will get 1 done in a deep, rich red. Please tell me where I can find this yarn. Love the color but cannot find any worsted weight cotton. Thank you! Love the beautiful pattern and can’t wait to make it! Thank you for sharing it. The web site for the yarn, http://www.knittingfever.com/, has a store lookup. The yarn is King Tut. I have seen it offered at several online stores, but none I have dealt with so can’t speak to their reputability. How do we get the chart that you say is available? This is a beautiful pattern! It’s a very crude chart. I just made it freehand. I think this will have to be my Christmas holidays project. Love pansies and putting them with fans is a great idea. This is beautiful. I love the pattern and the color you chose. Thanks for sharing. Never have I seen this. Must try to make it. I would so love to do this as a queen size coverlet – as a design over a plain summer blanket using materials as shown – how would this affect the size and what size hook did you use? this would be soo perfect – it’s really beautiful! To get a 92″x108″ size, start with a chain of 470. This will take 206 oz/10,630 yds of yarn. I used an H (5mm) hook. Would really appreciate if you could send me one. I don’t know why the link didn’t work. Does this work? This is so beautiful, and looks very Victorian. I can’t wait to make it. The purple is absolutely perfect! Just done a rough some rough sums, you would need nearly 41 x 100g balls, for the X large size. Hi Mama! I just looked at all of your beautiful designs here & on Ravelry. I can’t believe they are all free. Your directions are very clear especially the pictures for the different stiches. I have been crocheting and knitting for a long time and your designs and directions are better than some of the books out there that cost $20 and more. Thank you so much for all of these beautiful patterns. I am going to try to make all of them. God bless you and your hands! can this beautiful afghan be made a (3) worsted weight yarn rather than the mercerized cotton and which measurements would i use for a double bed and/or a queen size bed. this is beautiful and will make a wounderfull heirloom gift. The mercerized cotton yarn I used is worsted weight, so any worsted weight yarn should work great and be fairly close for gauge. Measurements for bedspreads vary depending on how long you want it to hang on the sides. I’ve seen double from 80 to 90 inches wide and queen from 90 to 100 inches wide. I love, love, love love, this. I have five sisters plus my mom in the nursing home and I know exatly what each of them gonna get for christmas. WOW! This reminds me of a doily….beautiful! I am using your pattern to made a neck scarf using Bucilla’s bedspread weight cotton thread. I have just started and so far it is very elegant. You have created a lovely pattern. Let me know more details about what is happening and I will try my best to help. I have been waiting to find the perfect pattern for a friend going through intense chemotherapy. I told her I was going to make her an afghan to take with her when she goes for treatments. Nothing seemed “just right” – until now. This is beyond PERFECT!!! I’ve already ordered my yarn (deep purple – her request). I will take a picture and send it when it is complete. She should have it for Christmas (or sooner – if I get done with finals in time). I cannot wait to make this. I think it will become my favorite “go to” pattern. Several others here are just as stunning, and I cannot wait to do them as well! I’m an overnight caretaker for my 91 yr old parents; crocheting is a PERFECT past time for me. Can you help? I made this beautiful blanket for my daughter for Christmas. It really is gorgeous in a golden maize color. However, I wished I had made it wider. Any ideas on an edging that would increase the size and compliment this wonderful pattern? I would like to widen about 8 inches. What about on just the sides, a single row of single crochet to form a base and then a few rows of the pansies? While I was reading through the comments I came across this reply and I am grateful for it!! Your suggestion would be perfect! I am seriously considering making this phenomenally beautiful pattern! I echo all the previous comments when I say you are so very talented and I really, really appreciate that they are free. Bless you for that!! A very lovely pattern and many thanks!! I love ripple afghans but I think this is the prettiest I have ever seen. I think it would make a beautiful shawl. OMG, this is a really outrageously beautiful pattern. Thank you so much for all of your patterns. You create masterpieces. Thank you again! I loved this pattern. I made one using 3 colors of Caron yarn. I would send a picture but I gave the finished afghan away. The colors used: Country Blue, Off white and pale yellow. They live near the ocean in the South so those colors look really good in their home and atmosphere. Fun to crochet. Thank you for sharing your pattern. I think your pattern look good but i am haveing problem with row 2 can’t understand your instruction when you say 2dc2tog in the next 4 sc need help. It’s two dc2tog in succession. In the next 2 sc, make a dc2tog, then in the next 2 sc, make a dc2tog. This is so beautiful! I just stumbled across it but know it is one pattern that I will definitely make. The design is stunning. You should get a book published with some of your gorgeous designs and. Put this one on the cover. It would fly off the shelves! If possible to answer please,what does multiple of 52 + 2 mean!!!!!!! I know for as many years that I have crocheted I have never figured out what that means. Have just walked away from pattern. I just cannot walk away from this one. It’s, as everyone has been telling u it’s too beautiful. The nice thing about my patterns is that you don’t have to understand the multiples/plus amounts given to use my patterns because I do the calculations for you. Most patterns give a number of chains to start with, but that number of chains can be modified to change the width of the blanket. The multiple is the number of initial chain stitches that are used in the repeat of the pattern. So by adding or subtracting that multiple to or from the initial chain, you can make the blanket narrower or wider. The plus amount is the number of additional chains that aren’t part of the repeat. The smallest size I have on this blanket has 158 initial chains. This is 3×52 which is 156 plus 2, so 158. Love this pattern. I was looking for an afghan that was a little more special for a wedding gift. I think I found it. Thanks for sharing your pattern. The repeat should bring you to the last chain in which you do a sc. I can’t wait to begin this blanket!! I have to finish another baby blanket for my “grandson to be” before I attempt anything else. This pattern is gorgeous! Want to say thank you for the beautiful fans and pansies. You do beautiful work and thank you for sharing it with us. I can’t wait to start working on it. Do you happen to know where if at all possible I can get a crochet pattern for a cable pull on sweater, My granddaughter wants one she is 12 years old. Everything is knit cable I wonder why that is. Your fans and pansies pattern is just beautiful. Although I’ve made ripple patterns before, but nothing that was as challenging or beautiful. I am up to row 3 and in the 3rd row of instruction where it says “(using next 4 dc), dc in next 2 dc, ch4, skip (sc, 3dc)” I find, after ripping it out 3 times, that I am still in the “straight” part with 4 stitches left before I get to the pansies part. There is no (sc, 3dc) to skip….I’m not sure what I am missing….should I be doing 1 double crochet in each stitch or 2 dc2togs in those stitches until I get to where the single crochet begins the pansies? I’m so sorry you are having trouble. When you are working row 3 across the completed row 2, the “straight” parts should have 13 stitches in them. Let me know if yours don’t because then we need to see what happened on row 2. In the straight parts of row 3, you will “use” these 13 stitches with 2 dcs, 2 dc2tog (uses 4), 1 dc, 2 dc2tog (uses 4), and 2 dcs. This is stunning. I have been crocheting since I was 6 years old, and that’s about 55 years now – this is the most beautiful ripple type stitch I’ve seen. It’s a repeat of 52 plus 2 chains, so a two repeat width would take a chain of 106. This would be 20.75″ wide. I made mine with King Tut Knitting Fever which is a mercerized cotton yarn that does have a very nice sheen to it. Pretty pattern. How can i make a shawl using the same pattern? If you want to make a rectangular shawl, you just have to decide if you want the ripples at the sides or the top and bottom and just make it with the dimensions you want to do that. I eventually want to make a triangular shawl pattern with these elements, but haven’t had a chance yet. A shawl would be beautiful!! I would like to make a rectangle shawl with the points on the short ends. I figure 20″ x 72(?). I am horrid at math (horrid is an understatement). Would you help me in figuring how much DK Cotton, how many stitches & hook size. ANY help will be highly appreciated. Regards. Use a H (5mm) hook. Start with 106 chains. You will need about 1500 yards of yarn. i talk to my granddaughter on easter. she wanted a new afghan in purple and when i saw this afghan i knew this was the one. it beautiful. bring on more. very very pretty and elegant! This is just such a beautiful and intriguing design. Having the luxury of a chart as well, is just the cherry on top. Thank you for sharing and for the pure pleasure of seeing this as a finished product once i’m done. Thank you so very, very much for offering your patterns for free. I appreciate it! Thank you for sharing your designs. I agree that color changes should be made between rows 6 and 7. I’m sorry you had to frog and start over. I hadn’t actually said where the color changes should have been made, so thanks for pointing out where it should be. I didn’t mean to be critical at all…the pattern is so pretty, I don’t know how many folks would stripe it. I had to so I could use both of their colors. Hi, first I just want to say that I love this pattern! I have been searching for a couple weeks for an easy yet elegant pattern to follow, and I finally found it! I am currently starting on Row 5 of this pattern. I ran into a problem. There is just a half fan at the beginning and end of each row. I am confused about the rest of what you are describing after that. I have a chart of this pattern if that helps, or if you can send me a picture of what you have, maybe I will understand better. i am in the process of crocheting this beautiful afghan. your directions are explicit and require no figuring out. i especially enjoy the number of initial starting chains for the various sizes. i wish more patterns were written that way. am looking forward to making two more afghans from your site. thank you so much for sharing. Hi, thank you very much for this pattern. When I compared to the chart, it looks like the first (4 dc) before the first (2 dc2tog) should be (7 dc). Am I misreading this, or have I miscounted something from using only one 52 multiple? I’m so sorry it took me a while to get back to you on this. There was an error in my chart which I have now corrected. The 18 sc in row one are actually 19 sc in a row because of the instruction that is done twice before the 18 sc. On row two, you skip the first and last of the 19 sc. With the 17 sc that you do stitch into, four on either end have single dc stitches, the four on either side of the center have two dc2tog, and the center has a dc. Never mind, I re-did the swatch with 2×52 groups and it worked. I think maybe I skipped the second 2 dc2tog. Thank you for the pattern! Would it be possible to get a graph on this one? Ah, yes. Already have one of this one. This is beautiful!! Thank you for sharing :); you have many wonderful patterns here. But, I am seeing this one as a wonderful shawl!! c’est absolument Magnifique !!! j’adore, je ne sais si j’arriverai à le traduire mais bravo et, surtout, merci pour le partage. I have used your patterns for afghans in the past. Each one turned out beautiful. I thought I was “afghaned-out” as I have made well over 2 dozen and have given most away as gifts. This one is just stunning!! Looks like I have one more to do. Thanks again for sharing your amazing talent! This is the prettiest ripple afghan I ever saw. It is very nice, but i would have preferred to understand how t o crochet this work by means of a Diagram of the stitch, it would be easier unless for me. But , thanks a lot for the pattern. There is a chart of sorts available. I hope it is helpful. Can someone give me instructions in making this as a scarf, just one repeat wide? Start with a chain of 54. Skip the directions between the **. On row 1, when you say single crochet in the next chain (twice). Do you mean single crochet twice in the next chain. Or single crochet in the next chain and the next. I did it the first one, but the pattern does not turn out. I am using 210 stitches. Please reply. thank you so, Love the pattern if I could do it. In the several places that instruct “twice”, it is referring to the instructions between the preceding brackets (“[” and “]”). That may be the source of the problem if you were only repeating the last instruction in the brackets. I so loves this pattern, I was looking for a feminine pattern to crochet lapagans for my granddaughters, and think this is perfect. Thank you so much. It’s The most beautifull think that I have seen, I like The crochet sincera I was about5 thank you. I am going to tray tomate it. Thanks. I HAVE BEEN KNITTING & CROCHETING SINCE I WAS 5 YRS. OLD. I AM NOW 74 AND THIS PATTERN IS SIMPLY GORGEOUS. IT TOOK ME A FEW TIMES TO GET THE FIRST LINE RIGHT, BUT IT’S WORTH THE EFFORT. I TEACH KNITTING & CROCHETING IN THE CLUBHOUSE WHERE MY HUSBAND & I LIVE AND CAN’T WAIT TO SHOW THIS ONE OFF. I’m sorry this is confusing. If it helps, anything that says “twice” is referring to the instructions immediately preceding that are enclosed in parentheses. 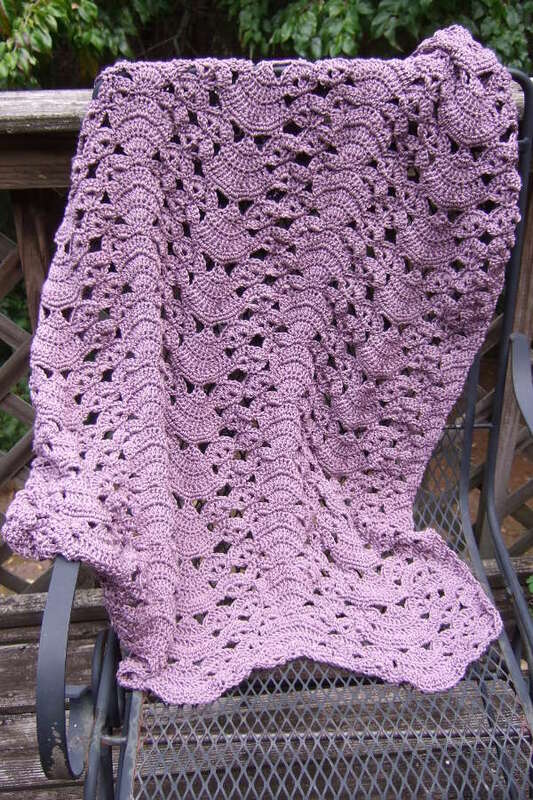 Greetings, How do i make a scarf with the Lovely Fans and Pansy Ripple Blanket pattern? It is so beautiful. You can make about a 10 inch wide scarf by starting with a chain of 54 and skipping instructions between the **. I’m going to make this for a table at church that is 60 x 30, I would like the wavy edge to be on the 60 side. So looking at the pattern I would do the large width, and the extra small length, is that correct? All though I would like it to be hanging a bit more on the width. So maybe 68 wide and 38 long. Is it possible? I’ve been searching for a beautiful pattern, this looks lovely. Thank you for your time and talents! looking at the instructions again, (I printed before reading, so the extra long was on the next page) I found the extra large width, so I think that will work. But I need to figure out how many ounces I need to order for the extra small length with the extra long width. I’m guessing the medium amount 72.95 oz? I did some calculating, and yes, using the medium yarn amounts will give you the XL width with the XS length or maybe a few more inches in length which you may want. If you the yarn you are buying has yardage on the package, use that (3760.95) first before using ounces, since all yarns weigh different amounts. This is amazing! I’m a beginner. Where does is it indicated on your patterns the level of talent needed to complete your project? Easy? Beginner? Intermediate? Advanced? I’m interested in starting a couple of your patterns, but I don’t want to slice my wrists when into the project finding that I’m over my head. I need to add that to my patterns. It’s on my to-do list. I would call this one, the Fans and Pansies Ripple Blanket an intermediate. Many of my other ripple patterns are beginner patterns. I am in the process of making this throw. I am using a worsted weight yarn which, of course, is requiring more thread and throwing the size off a good bit. Just wanted to let those who might consider doing this pattern in a worsted weight to go down a size in the number of chains for your base. My version has ended up as wide as the length I wanted. However, I’ll just continue on as directed until I have the dimensions I want. My finished product will just have the waves going lengthwise rather than crosswise, and it will make for a warmer blanket. You are masterpiece yourself and your patterns…. I can’t even find the words! I’ve only tried two and (shame on me) I didn’t leave a comment on the first, which was a shawl, so I wanted to make sure that I told you how beautiful your work is. I’m doing this one is Caron Simply Soft Robin’s Egg and it is turning out gorgeous. I make all my afghans to give as gifts to a very large family and they will be fighting over who gets this one! You will be my go-to site for the future. I love it; THANK YOU for sharing it. It is so unusual & quite an elegant stitch. So many possibilities…. I love pansies and ripple afghan patterns-this is the perfect pairing. Can’t wait to try the pattern! I was surprised to see a ripple pattern that I am impressed with. This is so nice, I am anxious to get started on one. Thank you. This is definately a shawl – I can see it! Thanks. I, too, love this for a ripple pattern. Aren’t many others I like in ripple. I can hear the oooohs and ahhhhhs already! This is the ONLY ripple afghan I’ve ever liked. Just fabulous! Thank you. This is beautiful! Thanks for sharing & thank you for providing instructions for all the different sizes. I just love that. Will definately give this one a go, just beautiful. Love the stitch… I’m working on a striped color changing version and liking it. I’m normally not a fan of ripple afghans but this one is different. This also makes a gorgeous scarf. I am doing one in Zauberwolle and just four full “fans” (about 6 inches wide in an F hook) and it looks wonderful. Hopefully I get it done in time for the next snow (supposedly Sunday). I love this pattern. I cannot wait to make it. I taught myself to crochet and always made the ripple pattern, but in the past year I got more confident and tried doing easy patters. I did make some beautiful afghans, scarfs and little purses on my own without a pattern. I’m disabled and sometimes don’t have enough money for my medicine but sometimes people give me yarn. So I’m bringing all the things I made to the kids in the hospital at Christmas. However, if I get any more yarn I’m going to try this pattern. I think k it’s just beautiful. Thank you from an old nona. Beautiful pattern. Very anxious to begin. In your directions it says “after 1st row make all stitches in both loops” so how do I do the first row? Thank you , I can’t wait to try this pattern. The first row is made into the beginning chain and can be made into single loops of the chains. Wish I could pop a pic of the finished product for you to see. Did it in Claret (burgundy), 64×68, and will be donating it as a raffle prize for local organization to honor National Telecommunications Week in April.. Thanks so much!! Want to do it again for baby blanket too.. I just want to thank you for this pattern. I’ve made six of them and one shawl over the past couple of years, in different colors and they all came out beautiful and the recipients loved them. I’ve been crocheting for over 35 years and I’ve never used a pattern so often or have enjoyed working on it more then this one. I keep getting drawn back to it. I made all of mine using Simply Soft because of the drape and sheen that it has. But I am intrigued that you used a cotton yarn. Since I haven’t made one of these for me, I’m thinking I’d like to try the cotton option. What did you use for yours? I used Knitting Fever King Tut which is a shiny cotton. I think the sheen really emphasizes the details of the pattern. I love it!!!! This is one that is so different that I can’t wait to make it. Thank-you so much. Stunning pattern!! Two questions. Is there a picture of a completed blanket posted somewhere? Second, can your shawl be made with this ripple edging, or can it only be made with a straight edge? I found some fuschia King Tut yarn online which will used for my sister’s birthday. There are also a lot of examples of the completed blanket on the pattern page for this pattern on ravelry.com. I didn’t think there was an attractive way to make the shawl with the ripple edging. What some have done is to make a wrap with the blanket pattern. That gives the wrap two rippled sides which can be the top and bottom or the side edges as desired. I don’t read charts, too confusing to the eye, please include which rows are the repeat rows and what row to end pattern in. I’m not retired, have crocheted off and on since I was a child, but new to this website and your patterns. They are not only beautiful, but also exciting because of the lovely details. It’s going to be a great winter of crocheting. This is a beautiful pattern. One of these days when I have some real time on my hands I am going to make this and this one will be mine. No one is going to get this but me. I just love this. Can’t wait to try it out. I am a big fan of afghans like this where I don’t get bored doing the exact same thing over and over! for people who just love to make afghans please make some for our soldiers out front. Do you have a web site address for a group that takes blankets for soldiers? What a beautiful gift from a very talented artist. Thank You!!! Many Welcomed Blessings to you for your Generosity. Do you have a shawl pattern using this stitch? It is lovely! The blanket can also be resized for a rectangular shawl. Your patterns are awesome. I am starting on this one next. I appreciate your chart of blanket sizes and yard requirements. That truly helps! Pattern directions are crystal clear and efficiently written. My thanks and complements! Tell me more about what you are confused about and you can even send me pictures and I should be able to help. Stunning! Thank you for the pattern and sharing your talents. So very generous of you to share these beautiful patterns with everyone. I found this pattern right before Christmas and fell in love with it. I’ve done two so far, and am working on a third … And possibly a fourth. It’s a pattern that is interesting enough to keep my attention, but simple enough that I’ve been able to memorize it. I can’t say enough how much i LOVE THIS PATTERN! In row two, the section that says to do 5 double crochets, in next single crochet, then to double crochet 4 times in the next chain space from the first row. There are several single crochet stitches with nothing in them between the double crochet 5 and the four double crochet in the chain space. Is there a typo in row 2, or am i missing something. I am a totally blind crocheted, and normally don’t miss much with this spurt of thing. Thanks for any advice. This blanket makes a lot more sense once you get through the first set and can see the pattern emerge. I’m going to break down these two rows into their elements which I think will help with seeing how the stitches should line up. Half Upward Fan: sc in last ch. Turn. Half Upward Fan: 3 dc in last sc. Turn. Those 5 dc in one sc should be made in the center sc of three sc. You will make a sc in the first and third sc (on either side of the 5 dc). On Row 1 the pansy bases are the (dc, ch2, 2dc, ch2, dc) shells. You will make the 4 dc sets in the ch-2 spaces of these base shells. I sure wish this was do-able with your No Beginning Chain routine. It is soo gorgeous! With my failing eye-sight, I can’t do regular patterns. I now can ONLY do your no-beginning-chain patterns or the granny-square-shell pattern. On the acrylic you may not need to block it at all, but if so, it will do well with dampening and shaping flat. For the cotton thread table runner, I would probably use an odd number of repeats, maybe three for a narrow runner or five for a wider one. The last two columns of the chart gives the ounces and yards of yarn needed for each size. You mentioned that a chart is available for this gorgeous blanket. HOw do I purchase it. would go so much easier.